Thank you so much for your interest in this Inner Wisdom Circle, which has been rescheduled for 2019. To be notified about our next Inner Wisdom Circle, or to schedule a complimentary Inner Wisdom coaching session, contact Stacey@PathOfSelfLove.org. A 3-Month Inner Wisdom Circle for Women Who Would Love to Transform Their Inner Critic and Strengthen the Connection to Their Intuition by the End of 2018. Join us to transform your negative self talk & self sabotaging toxic habits, strengthen your self-awareness & deepen your connection and trust in your inner wisdom… with proven structure + fun super power tools + coaching + sisterhood + more! Have a breakthrough in whatever area(s) you are settling or stuck in your life right now. Stop self bullying that plagues your mind, heart, body and spirit and can lead to anxiety, depression, doubt, confusion, fear, loneliness, and despair. Have the tools to decipher between when you’re making choices based on fear and past programming versus when you’re inner wisdom and loving truth are guiding you. Take a stand as the confident, courageous, self-aware woman you were born to be, so you can always make self supportive choices that honor who you are & what you need. Strengthen your ability to choose self-compassion and patience for yourself over self-criticism and pressure. Strengthen your self-trust and your ability to make empowered courageous choices. Expand your ability to access and tune into your intuition. 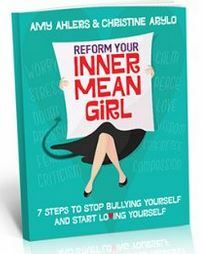 Based on the best-selling book Reform Your Inner Mean Girl. The revolutionary practices, tools and wisdom that you receive in this circle have helped over 25,000 women on six continents break their self-sabotaging habits and cure their self-critical thoughts using a powerful, proven process that transforms a woman’s thoughts, emotions, actions, and feelings from self-criticism, self-doubt, and self-sabotage to self-empowerment, self-compassion, and self-care. Inner Wisdom Circle starting October 16th, with Christine Arylo and Stacey Hoffer. We’d love to have you join this supportive circle of women. EMPOWER YOUR INNER WISDOM. EXPOSE YOUR INNER MEAN GIRL. A 3-month personal transformation circle for women who are ready to have big breakthroughs before the end of the year. If you are reading this invitation, we imagine you, like many women, are trying to figure out how to best change toxic habits or end painful negative self-talk that sabotages you and say YES to making self-loving choices and actions that support you, sustain you, and allow you to thrive. We know all about the pushing and pressure Inner Mean Girls can put on you in your everyday life that compromises your well-being! Relationships: They can put you in the wrong relationships or convince you to stay too long in unhealthy relationships. Career: They can guilt you into taking the save choice when it comes to your career, instead going for your dreams. Money: They can seduce you to spend too much money or scare you to under value your worth. Work: They can guilt you into overworking and over “doing” – leaving your soul starving for the joy and rest it needs. Body: They can say mean things to you about your body. While your Inner Man Girl is trying to keep you safe, she’s actually keeping you from living your truth, following your dreams, and having what you desire. The truth is, you have the power, wisdom and guidance within you to make self-supportive and empowering choices, even when you’re triggered by self-doubt, stress, fear, guilt and pressure. All women have an Inner Wisdom. There are no exceptions! YOU were born with a solid connection to your inner guidance system. But chances are, somewhere along the way you may have unconsciously shut down your connection to your Inner Wisdom. This is not your fault. Most women have not been taught how to access their Inner Wisdom or worse they have been taught to disregard and diminish their super powers of self-trust and intuition. Here’s the good news, your connection with your intuition and Inner Wisdom was never severed. With proven self-love tools and practices, you can quickly access your Inner Wisdom over the voice of your Inner Mean Girl. The yogi’s say, when you can learn to access your neutral mind – aka your Inner Wisdom – you can know your truth in 9 seconds. Now that is super power! During this 3-month transformational circle, we will provide you will the structure + support + super power tools + sisterhood that will open up the channels to your INNER WISDOM (inner knowing, inner guidance system, inner best friend, inner truth and inner wise woman). Reveal your Inner Mean Girl archetypes – there are a total of 13. Expose your Inner Mean Girl’s toxic habits – there are 33. Discover what triggers and motivates your Inner Mean Girl – and why you created her. Give Up self-bullying once and for all. Access and open your 6 intuitive channels for tapping into your Inner Wisdom. Make your Inner Wisdom your most trusted ally and learn to follow her guidance, no matter what. Know what’s motivating your Inner Mean Girl (this is so important) and have the tools to breakthrough from whatever is blocking you from creating the reality your heart and soul desire, for yourself and the world. Be highly tuned into your intuition and Inner Wisdom – so you can discern between your Inner Wisdom and your Inner Mean Girl. This life saving practice will stop you from making sabotaging choices in work, relationships, money and health & help you start making supportive self-loving choices that honor who you are & what you need. Have tools to transform toxic habits, such as comparison, judgment, overworking, body hate, fear, shame, pressure…. or whatever toxic habit is sabotaging you or keeping you stuck right now. …so by the beginning of 2019 you can set your intentions, design your life, and focus your life force energy in ways that matter most! PLUS a Special New Year Inner Mean Girl Makeover Session in January. We will deep dive into your Inner Mean Girl to reveal and understand this sabotaging force, where you can see her, observe her, name her, and lovingly disarm her. This allows you to understand how she operates and discover what triggers and motivates her (so you can notice her flare ups and proactively transform her self-sabotaging habits). Bring your Inner Mean Girl to life, so you can work with her and transform her. 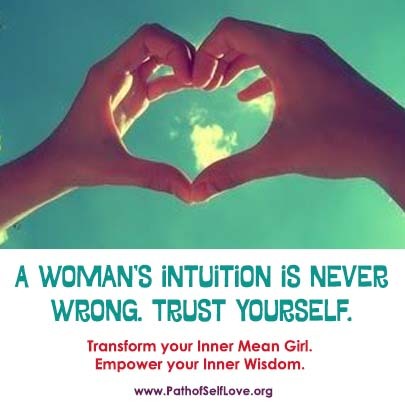 Create a personal “Inner Mean Girl Preventative Plan” so you are fully supported spiritually, emotionally, physically and relationally when your Inner Mean Girl flares. Learn how to de-activate your Inner Mean Girl when she attacks you with negative self talk, self-sabotaging actions, and feelings of fear, anxiety, worry, self-doubt. Speak from your Inner Wisdom – learn to freely and fully speak from your intuition, without apologizing or holding back. See evidence of how your Inner Wisdom is already working for you – see where and how your Inner Wisdom has already come through for you in the past, understand where your intuition is strong, and become aware of where you have room to grow and trust your inner knowing. Make choices that allow you to stay true to yourself and learn how to follow your Inner Wisdom’s guidance, no matter what – learn how to make choices in the moment by tapping into your Inner Wisdom, listening to your body & emotions before acting, and then following that guidance in small but might ways. Create a consistent daily practice of connecting to your Inner Wisdom – learn different ways to tap into your Inner Wisdom every morning. Get support when making big choices so you can really hear your Inner Wisdom + be supported as you step forward courageously – your power comes from being in community with others who can reflect our wisdom. It’s not weak, but it is wise to create support networks that help reflect your loving truth so you can make the best choices for yourself. Woohoo! You will finally shift toxic self-sabotaging habits – the ones that drain, distract, and diminish you – into self loving actions that support you to thrive, help you make choices that align with your heart and soul, empower you to stay true to yourself, and gives you permission to take care of yourself and receive what you need emotionally, physically, spiritually and mentally. Identity which of the 33 toxic habits are causing the most havoc in your life right now. Learn proven tools and practices (that you can put to use in your day to day life) to EMPOWER yourself to make choices that support you vs. sabotage you. Shift (or be open to shifting) the toxic habits running your internal operating system and get crystal clear on the self-sabotaging habits that are causing the greatest about of pressure in your life and are creating the biggest consequences for you. Get to what is at the root of your toxic habits (this is about healing the root issues, not sugar coating the symptoms). Take a stand to shift and transform your toxic habits into self-loving thoughts and actions. Join us in January for a special Inner Mean Girl Makeover, where you’ll give your Inner Mean Girl a makeover and new job! This is not just a “program”. It’s a circle and a sisterhood. You can participate self-study or take full advantage of this amazing global community of women. At the Path of Self Love School, we structure and run our offerings the feminine way… with FOCUS and FLUIDITY, MOMENTUM and SPACIOUSNESS. The Structure and Flow are here to make sure you don’t get stuck. The Sisterhood and Personal Coaching are here to support you through any resistance or distractions that show up. Weekly Wisdom Packages and Teachings, including teaching videos, guided meditations, and resources to activate you into the next phase of your breakthrough – delivered via email every Saturday. So you will be able to self-pace your self-love work during the week. 13 LIVE Weekly Inner Wisdom Circles (join via video or phone) on Tuesdays at 5pm PT | 8pm ET. This is where the transformation and connection in sisterhood happens (you don’t have to attend all circles to participate, but the weekly flow and accountability keep you committed to yourself). Three 1:1 Personal Coaching Sessions with a Certified Self Love Guide (optional & recommended): Inner Mean Girl Illumination Session in Oct., Intuition/Inner Wisdom Guidance Session in Nov., and Toxic Habit Catalyzation Session in Dec. or early Jan.
We begin on October 16th. You’ll receive a full schedule with dates in your welcome packet. This will be our opening circle to set our strong intentional journey with each other. During live circles, you’ll experience interactive tools and practices, that are fun and powerful, learn from and be inspired by other women, and receive wisdom booklets that you’ll have to use as reference forever (you can participate as much or little as you like). There’s an online community classroom to share your experience and to connect with inspiring women. Most people don’t attend every Inner Wisdom Circle, and that’s okay. All live circles will be recorded and stored in our online resource library. so you can breathe and relax into it. You’ll have lifetime access to the online resource library to access all of the materials. A Personal Transformation and Breakthrough – including the path, process, wisdom and structure for empowering your Inner Wisdom, exposing your Inner Mean Girl, and finally transforming those toxic self-sabotaging habits that have been weighing you down. Weekly Teaching Transmissions from Christine Arylo – these transmissions will guide you personally through this powerful, proven process (these are also available to download as audio files). Watch the videos or listen to the audio files. Live Weekly Group Circles with Stacey Hoffer – these will be a mixture of “love seat” coaching, interactive exercises and teachings to deepen your experience. You’ll also receive direct access to our Inner Wisdom Guides and Self-Love Coach to deepen your transformation, ask questions, and get support, accountability and love! Attend via video or audio, or listen to recording. Inner Mean Girl and Inner Wisdom Super Power Tools – each week you’ll receive practical and powerful wisdom, exercises, worksheets, meditations, processes and practices – including Inner Wisdom daily practices to strengthen your intuition and powerful tools to de-activate your Inner Mean Girl, such as – The Inner Mean Girl Expose, The Self Sabotage Preventative Care Plan, The Inner Wisdom Two-Step, and the much loved Love Lines and Love Mantras. Connection and Sisterhood – belong to a wise women sisterhood filled with authenticity and vulnerability. Being in a supportive circle of women makes it easier for you to strengthen your confidence and courageously create the life you desire. For us, and many powerful wise women we know, it’s been sisterhood, support and being in the presence of other women on a similar path that has made all the difference in our ability to live in alignment with our powerful, wise, and compassionate inner voice (aka Inner Wisdom). Engaged and Confidential Online Community Classroom – this will be an active, private group, where you can participate as much or as little as you like to share your experiences, connect with and be inspired by others, and interact for fun and support. Access to the Empower Your Inner Wisdom, Expose Your Inner Mean Girl Library – you will have lifetime access to the recordings, teachings, videos, audio files, exercises, worksheets, tools, meditations, processes, practices and more, so you can continue to access your Inner Wisdom and love on your Inner Mean Girl for years to come. Proven Brain Science to Rewire Your Negative, Self-Sabotaging Patterns and Beliefs – use the latest brain science research and best practices to re-wire your brain so you can become the person your Inner Wisdom already knows you are. If you would love personal support, mentorship, guidance, & intuitive illumination we are here to hold this catalyzing space with and for you through Personal 1:1 Coaching. Receive 3 private one-hour coaching sessions with Stacey Hoffer to receive extra support and guidance during each step of your personal transformation. Illuminating Your Inner Mean Girl: In October you will work with Stacey to expose and build a stronger relationship with your Inner Mean Girl. Accessing Your Intuition and Inner Wisdom: In November, you will work together to strengthen your connection with your intuition and Inner Wisdom. Catalyzing Toxic Habits and Breakthoughs: And in December or early January, Stacey will masterfully guide you to transform toxic habits that drain you and are keeping you the most stuck so you can make sure you get what they need emotionally, physically, spiritually and mentally… and so you can step into 2019 with confidence, courage and clarity! If you are wanting 1:1 guidance for reflections, intuitive insights, support, intention setting, accountability, focus and illuminating your Inner Wisdom, then this is a great fit for you. YES! I’m Claiming My Space in the Circle. If you have questions or want to talk to someone about the Personal 1:1 Coaching level, click here to set up time to talk with Stacey. People say their consultation session with Stacey gives them so much inner clarity and focus. Click here now to schedule time to talk with Stacey. This course is offered by The Path of Self Love School, with Christine Arylo and Stacey Hoffer. 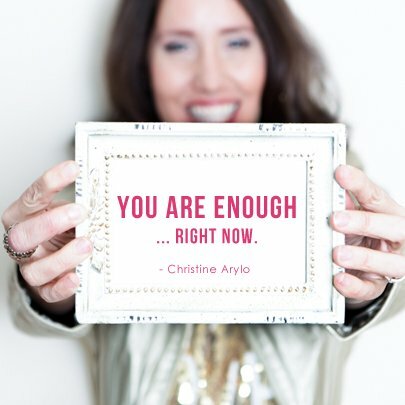 Christine Arylo is a transformational teacher, women’s leadership advisor, MBA and founder of The Path of Self Love School. She’s written three best-selling books on self-love including of Choosing ME Before WE: Every Woman’s Guide to Life and Love, Madly in Love with Me: The Daring Adventure of Becoming Your Own Best Friend, Reform Your Inner Mean Girl: 7 Steps to Stop Bullying Yourself and Start Loving Yourself, as well as The Self-Love Coloring Book and Journal: Heart Art for Loving Yourself More Every Day. Christine’s work on self-love has been noted by other transformational teachers as ‘an illumined path of self-love’ that takes loving yourself beyond a concept to a tangible path, practice and choice. In 2007, Arylo founded the International Self-Love Day, on February 13th, which has hosted events in over 41 countries through over 1000 Self Love Ambassador to bring awareness to self-love and to teach it in practical, playful and powerful ways. Arylo’s work has been featured on CBS, ABC, FOX, E!, The Huffington Post, the Daily Om and TEDx. 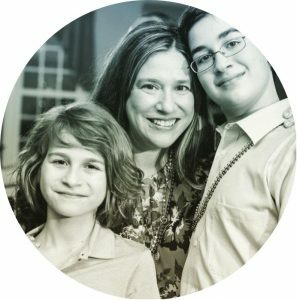 Stacey is becoming recognized as a global thought leader in raising children to love themselves and is a strong advocate for parents and teachers modeling self-love, knowing we can only teach our kids what we embody ourselves. She provides practical self-love tools to parents, guardians and teachers to help children create a strong inner foundation of courage, compassion, and self-awareness that empowers them to be healthy, resilient, confident and empowered. 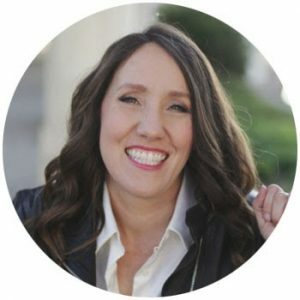 Stacey has been featured on TODAY Parenting, Empowering Kids Now, The Self-Love Mothering Summit, Self Discovery Radio, BlogHer, and Blog Talk Radio. The Path of Self-Love School is a school that teaches and guides adults and children to create strong inner foundations of courage, compassion, clarity, and confidence using the power, tools and practice of self-love. Founded by Christine Arylo, world-recognized expert and transformational teacher of self-love and three-time best-selling author on self-love, the school’s programs have reached over 35,000 students. The school has also trained Self-Love Guides on six continents. “Most women and girls I know are harder on themselves than anyone else could ever be. But few have been taught how to work with this inner force, or how to access their inner wisdom. This is the realm of self-love, beyond self-esteem. Without access to our inner wisdom and self love, we don’t learn to trust our true selves, so we create lives that don’t honor our true selves. 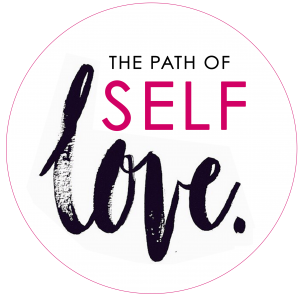 I founded The Path of Self Love School and Stacey Hoffer and I are teaching this transformational course because negative self talk, self doubt and all the ways we sabotage ourselves is a part of being human. But if we let that part ourselves run our choices and thoughts, instead of creating a strong relationship with our Inner Wisdom and learning to compassionately give ourselves what we need, we cannot be the brilliant, radiant, strong women we came here to be.” – Christine Arylo, Founder of The Path of Self Love School. What if I am not able to join the live Inner Wisdom Circle? Most people don’t attend every live circle, and that’s okay. All live circles will be recorded and stored in our Online Resource Library. What day and time are the live Inner Wisdom Circles? The live Inner Wisdom Circles are on Tuesdays at 5pm PT / 8pm ET. What is the cancellation policy? We hope you will love this course which gives you lifetime access to all of the materials. Students can cancel within the first 10 days of purchase by emailing cancel@chooseselflove.com and you will be refunded the full amount minus a 10% handling fee. If after 10 days you decide to cancel, your tuition will not be refunded but you can choose to stop receiving communications or transfer the class to another person by emailing our customer care team at cancel@chooseselflove.com.